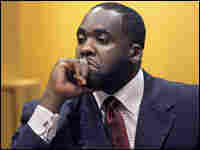 Reports: Detroit Mayor Kilpatrick Expected to Resign : Tell Me More News reports coming out of Detroit indicate that embattled Mayor Kwame Kilpatrick is expected to accept a plea deal this morning requiring the mayor to resign from office immediately and serve jail time. UPDATE: Detroit Mayor Kwame Kilpatrick has accepted a plea deal requiring him to resign from office immediately, pay $1 million in restitution, surrender his law license and serve four months in jail. News reports coming out of Detroit indicate that embattled Mayor Kwame Kilpatrick is expected to accept a plea deal this morning requiring the mayor to resign from office immediately and serve jail time.